Interview with Jenny (and Martin) Irvine about the former’s memories of her early childhood at the wetland. Interviewed by Charlie Catt at their new home in Kaipoi on Monday 30 March 2015. What follows is a summary of what was said. It is not a verbatim account. This summary has not been edited and what has been written is produced in the same order in which Jenny said it. Jenny knew what is now called Travis Wetland as Floreance’s farm, which was a dairy farm in the 1950’s. Jenny first got to know of the farm in about 1950 as they sold their milk via a horse and cart in North New Brighton and she went out to the cart with her billy to buy the unpasteurised milk. Jenny’s next contact with the Floreance family was through Lynn (sp?) Floreance, who was a school friend. The Floreance family; Nan (mother), Gus (father) , Lynn and her younger brother David lived in what is now the Travis Education Centre, and Jenny often stayed with the family in the school holidays. (Lynn died in 2013). The farm had 80 cows and Gus’ brother Auburn also worked on the farm and he lived on Travis Road and much later in the 1970’s one of Jenny’s colleagues lived in that house and she recalls that there was a fire going all year round as the house was constantly damp, being surrounded by water. The farm extended all that way (on that side of Frosts Rd). Uncle Clary, who was brought out from England, lived on his own in the small house (now used by IHC) next to the main house, but he joined the family for meals. Gus made a certain amount of his own farm machinery. For example he made a kind of conveyor belt with spikes on it to make it easier to get hay bales to the top of the barn. The family also owned French Farm, which was the other side of Mairehau Rd. (what is now Tamara Park) and that was the drier part where the hay was produced. Nan was also from England where she worked in a bakery. She made delicious scones on the farm that were then taken in her Wolseley car (along with the children) into the paddocks to feed the farm hands. The scones were devoured with lashings of farm butter and cream! 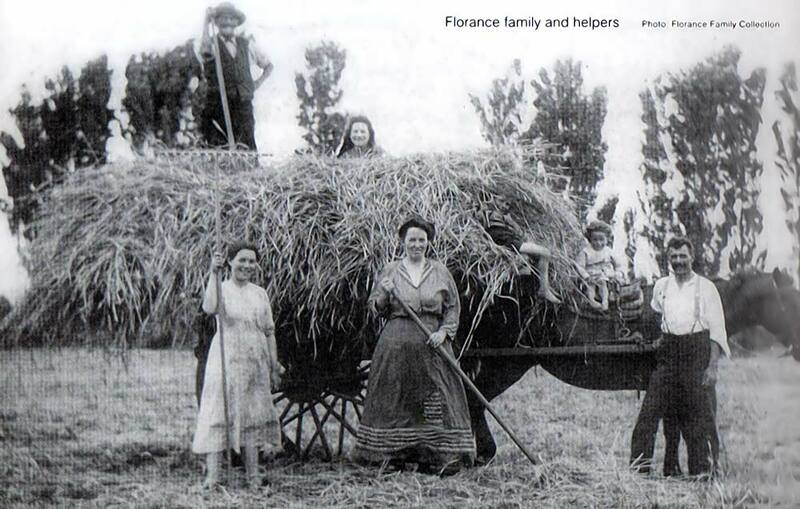 Hay making was clearly quite an event, as Nan would also hitch a trailer to the Wolseley and put a pianola (sp) in it and take that to the paddocks too, although by all accounts she missed a note or two. Most of the farm workers were in fact friends, family or neighbours and family picnics often took place during the hay making period. The cows were grazed on the wetland part of the farm but they would often get stuck in the mud. To get them out a raft was constructed of planks of wood and metal drums. This was propelled by the use of pitch forks. Jenny said that often the children would go on the rafts but would also fall off from time to time, and then return to the farmhouse covered in mud and slime. There were a number of dangers on the farm and Gus was hospitalised once after being charged by a bull. The family added a lounge to the farm house (on the south side) and it was beautifully decorated and there was a Begere suite – the pinnacle of good taste at the time. When the farm workers came into the house they were not allowed into the new lounge area; they were kept in the kitchen. There was also a swimming pool close to both the house and the bull paddock; the bulls often craning their necks to have a look at what was going on in the pool. Jenny recalled seeing a ‘Lazy Susan’ in the house that was there until quite recently. Martin reminded Jenny that once Gus had gone out shooting pukekos and returned with a trailer load of them. However, he always felt guilty, both that he had shot so many and that he didn’t know what to do with them. [Note: David Floreance (Lynn’s brother) is still alive and Jenny said there is a lot of information about the farm in the New Brighton museum, if it still exists post-earthquake].